How much does Bryan University charge for tuition today, and how much are charges predicted to shift? How does this differ from other colleges? Find out on this page. Learn how tuition and fees at Bryan University measure up to the average and see how to successfully get ready for probable college tuition growth. For nationwide, regional and statewide comparisons, look at the table below to find out how Bryan University compares to other colleges. Full-time undergraduates at Bryan University were charged $11,172 in fees and tuition in the 2017 - 2018 academic year, before adjustments for financial aid. Of this amount, the price of tuition totaled $11,147. $25 was the cost of fees. Alas, this college doesn't offer any reductions to students who live in state. Bryan University Los Angeles fees and tuition is the number charged to students for one year of attendance, not including room and board. Yet, a lot of students end up spending under maximum tuition because they get financial aid and other reductions. There continues to be a rise of 11.2% in Bryan University fees and tuition for out-of-state students in the past five years. Tuition increased by 11.2% and fees increased by 0.0%. This school year, students can anticipate paying $12,422 based on current estimates. Because of price growth, the total expense of a four-year Bryan University degree would be $58,668, and the total price of a two-year degree would be $26,234, not including extra costs for books, transportation, and room and board. 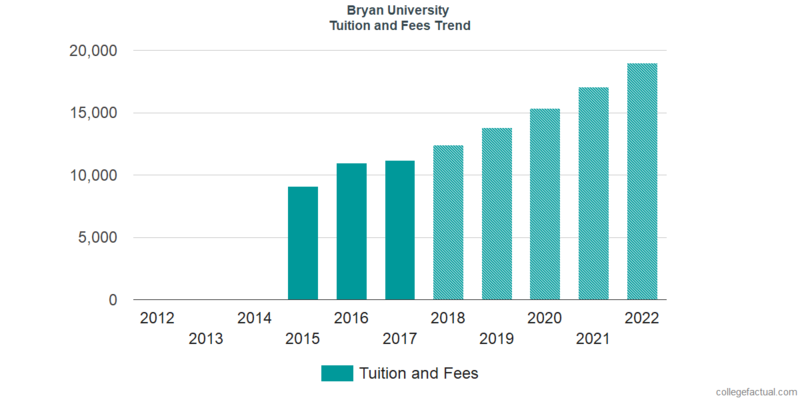 Look at projected potential tuition and fees for Bryan University students in the following chart. Due to the cost of living and other factors, the cost of college has a tendency to increase each year. For this reason your last year of school may very well be much more than your first year.